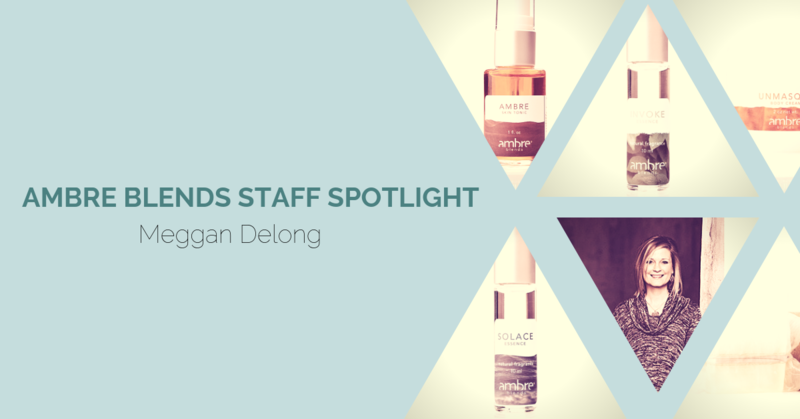 Although Meggan has been making candles for Ambre Blends for over 10 years, she just recently joined the Ambre Blends team full-time working in production. Starting in April 2017, Meggan Delong came on board making not only candles but all the products and essences you love! What is a day in the life of Meggan like? Oh goodness…getting up early and making sure my girls (17 & 14) are set for the day before coming into work. Then tackling our to-do list for the day to keep up with all the orders. It’s been crazy! Then heading home and having family time or running errands. What is your favorite part about working for Ambre Blends? The people for sure! Everyone treats you like a big family and you feel so loved. I couldn’t ask for a better place to work! I do love making the products though. What are some of your favorite organic products that you use? Mostly food, I love to cook and bake. What is your favorite Ambre Blends product/essence? I can’t pick a favorite. I have always been a devout Solace Spritzer girl, but Ahnu is fierce competition – especially when layered with the Solace and Unmasque. I like the Ahnu Body Cream with Ahnu, Unmasque or Solace Essence Oil. And the Ahnu Natural Deodorant, love that! And my hubby smells so yummy in the Ahnu Essence Oil that I’ve told him he can’t wear it out of the house when I’m not with him! What is a fun fact about you that people don’t know? I have two middle names. My mom originally name me Nicole Renee, then changed my name to Megan when I was less than a year old. When I was in second grade I think, my parents noticed on my birth certificate my name had been spelled with two g’s. It’s handwritten on the side because I’m that old…it has made it difficult to get a passport! What do you enjoy doing outside of work? Hanging out with my family! My husband has hung four hammocks from a tree in our backyard so we like to chill out there or on the back patio. Why should people be using Ambre Blends? Because it smells amazing! I love that it smells a little different on everyone so you don’t mind when your friends/family are wearing the same thing you are. I wish people knew how truly devoted the Ambre Blends family is to the brand and how much pride we take in doing things to the best of our ability. We’re all constantly thinking of better ways to make things happen and make the product best for our customers. What has been one of the most rewarding experiences about working at Ambre Blends? The relationships, by far! I’ve always adored Ambre and Steph – they were the ones I interacted with most when I was only making the candles, but the conversations we get to have working so closely are very rewarding. What was your first job? I think it was working at a church after-school program with elementary students.